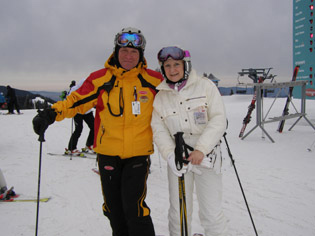 The Adventure Kids aka Debra C. Argen and Edward F. Nesta "discovered" that downhill skiing at the Mont-Tremblant Ski Resort in the province of Quebec, Canada, voted the #1 ski resort in Eastern North America offers thrills for skiers and snowboarders of all levels of experience. 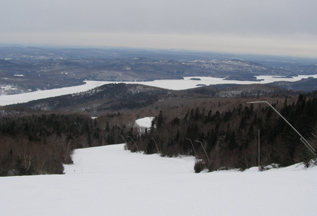 Mont-Tremblant is the highest peak in the Laurentian Mountains and has a top elevation of 2,871 feet (875 meters), a vertical drop of 2,116 pi/feet (645 meters), 14 ski lifts serving 95 runs comprised of beginner, intermediate, and expert runs, to appeal to all levels of experience, and has an excellent Ski School. In late February 2011, we flew to Mont-Tremblant, Canada to once again experience this breathtaking winter playground, and rather than haul our ski equipment on the plane with us, we traveled light and opted to rent state-of-the-art Solomon skis and boots at the base of the mountain from the Adventure Center (Centre Aventure - Chalet des Voyageurs), which was the ultimate in convenience and provided us with the opportunity to "test-drive" so to speak, new Solomon ski equipment. We woke bright and early, had breakfast, dressed warmly in our ski suits and our new state-of-the-art Smith Optics Helmets and Smith Optics Goggles, headed to the Adventure Center, and after picking up our rental ski equipment, we were ready to hit the slopes. Edward: Although Debra is an experienced skier and grew up skiing, I am a beginner skier, and decided that it would be a good idea to take a lesson with the Ski School (École Sur Neige) to better appreciate my time at Mont-Tremblant Ski Resort. Together with Ski School Instructor Sylvain Hotte, Debra and I boarded the Gondola where my excitement grew as we were whisked up the mountain with the colorful Pedestrian Village fading in the distance. When we reached the summit, Debra and I went off on our separate ways, and Sylvain Hotte put me through my paces for my 2-hour lesson where I had the opportunity to brush up on my skiing techniques. With Sylvain's "threats" ahem, I mean, assistance, by the end of my lesson, I was able to eliminate some of my "bad ski habits" including my desire to lean back in my skis which kept throwing off my balance, and I was finally able to traverse the mountain with confidence and a bit of style I might add. 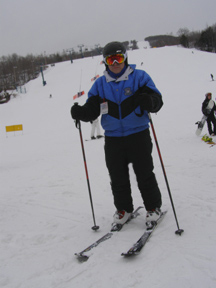 I especially enjoyed learning to do a quick stop and send up little snow clouds around my skis. 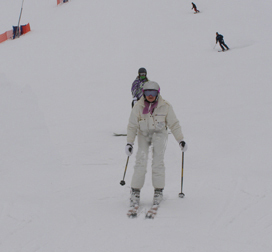 Debra: Having grown up skiing, it is interesting to look back and note how the sport has changed over the years, including the fact that snowboarders and skiers now share the same space, where once there were separate runs for each sport. Also of interest is the growing number of skiers and snowboarders who are now wearing helmets, including The Adventure Kids - Debra C. Argen and Edward F. Nesta. Once the only thing I wore on my head was a headband, I have come to realize the importance of safety and am more than happy to don a cool helmet. 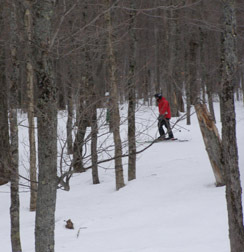 In fact, many ski resorts, including Mont-Tremblant Ski Resort recommend wearing helmets, and if you plan to partake of the special Snow Parks with rail and jump modules, helmets are mandatory. Since Edward was off having a lesson, rather than ski by myself, I decided to take advantage of the Free Mountain Guided Tour and had a great morning skiing with Luc Bechard, one of Mont-Tremblant's experienced and friendly Ski Guides. This fun and interesting program provides skiers of all skill levels new to Mont-Tremblant with the opportunity to ski with an insider who will provide information on the slopes as well as join them for a few runs for a 45-60 minute ski tour. Luc was able to provide me with the lay of the land so to speak, and the "ins and outs" of skiing Mont-Tremblant, advising me on the conditions of the trails, where the best spots were if I wanted to ski through the glades, and pointing out scenic spots along the way where I could stop and take photographs. Mont-Tremblant has four "versants" or faces, and Luc and I skied Versant Nord (North Side), which had 3 easy runs, 8 difficult runs, 14 very difficult runs, and 5 extreme for expert runs, and we also experienced parts of the Snow Park on the run Lowell Thomas with its rail and jump modules. We continued skiing on Versant Edge (The Edge), which provided stunning panoramic views of the frozen lakes below, and offered its own challenges with 1 easy run, 3 intermediate runs, 1 very difficult run, and 3 extreme for expert runs. We also skied Versant Sud (South Side), where there were 14 easy runs, 9 difficult runs, 12 very difficult runs, and 4 extreme for expert runs. Breathtaking scenery, diverse, well-groomed runs for all skill levels, excellent services including the friendly and professional Ski School and Free Mountain Guided Tours, are all part of why Mont-Tremblant Ski Resort was voted #1 resort in Eastern North America. 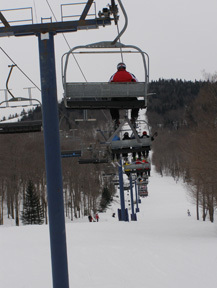 The Mont-Tremblant Ski Resort 2010 -2011 season runs from November 25, 2010 until April 10, 2011. Starting December 11th, Free Mountain Guided Tours are conducted every day at 9:30 am and 1:30 pm. Register inside Le Grand Manitou at the Customer Service Counter and then meet at the summit's Giant Trail. Hours: Everyday from 8:00 am until 5:00 pm. Read other articles on Mont-Tremblant, Canada in the Destinations, Hotels and Resorts, Chefs' Recipes (in English and in French), Spas, and Adventures sections.